I felt that I needed to share my ideas for Nursery Singing Time. I am the designated singing time leader in my ward (congregation) for Nursery, and I LOVE IT! I have been in this calling for 2 years now, and in that time I have come up with ideas to make singing time fun and interactive for the little ones. Here are a few things that I have made for the list of songs that we sing each week. Bracelet Bells: made from colored pipe cleaners and small silver bells. We use these when we sing, If You're Happy (children's songbook page 266). Sunbursts: cut out using my Cricut, laminated with the clear shelf liner, and large popsicle sticks. This is for Jesus Wants Me for a Sunbeam (children's songbook page 60). Stars: I found there cute stars in the Super Little Singers CD that I bought. I printed them out on yellow card stock and laminated them with the clear shelf liner and used large popsicle sticks. We use these when we sing I Am Like a Star (children's songbook page 163). You could also use these for Twinkle Little Star. Ribbon Wands: I used small dowels, I found them at Michael's, with 3 different shades of blue ribbon and pinned on top with a thumb tack. The kids love these, but I always have to remind them to wave them down low to mimic water, as we use these when we sing "Give", Said the Little Stream (children's songbook page 236). Egg Shakers: I used plastic eggs filled with beans, they make more sound than rice. I hot glued the eggs shut. We use these when we sing Do As I'm Doing (children's songbook page 276). I also like to let the kids choose the songs instead of me. So I've made a few things to help with that. Music Sticks: I painted large popsicle sticks in different color, and wrote the songs on each stick that we sing each week. I try to give each kid a turn to pick a stick. Fishing: I found pre-colored fishes in the Super Little Singers CD that I printed, cut and laminated. I wrote on the back of each fish a sing. Each fish also has a paperclip on it. I also made a fishing stick using a dowel, ribbon and magnet. This is also a big hit with my little ones. Music Flowers: This is my newest way for the kids to pick the songs. I found pre-cut foam flowers at Joann's. I painted large popsicle sticks green for the stems and wrote the songs on each of them. Hot glued the stems to the flowers and put them in a cute little basket to carry. Go HERE for the tutorial to make them. Here is a list of songs that I teach each week. I also have a reverent song that gets the kids ready for their lesson time, which is I Am a Child of God. But just before we sing I will give each kid a "reverent" sticker. For my older nursery kids I also do a wiggle song to get them ready for the reverent song, which is My Hands (children's songbook pate 273). Each class takes me about 10-15 mins, which is recommended. It allows the teachers to get ready for the next part of their schedule. I have a few other ideas that I plan on making, so once I have those made I will share. But for now this is all I do. With Spring here I wanted to make a new way for my nursery kids to pick the songs that we sing each week. So I came up with music flowers, here's how to make them. The first thing I did was paint the popsicle sticks green. Then I cut out the orange and yellow middles and stuck them to the pre-cut flowers. I then wrote the songs on the back of the sticks and hot glued them to the back of the flowers. Voila! There you have super cute music flowers that the kiddies will enjoy! Mine loved them! I will now be listing the Bapron in my shop. 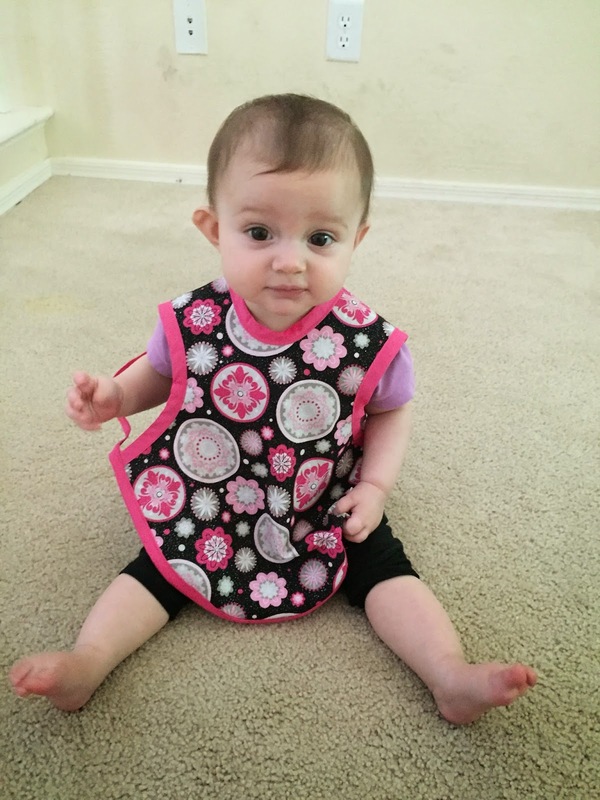 my adorable baby modeling the 6-12 month bapron. 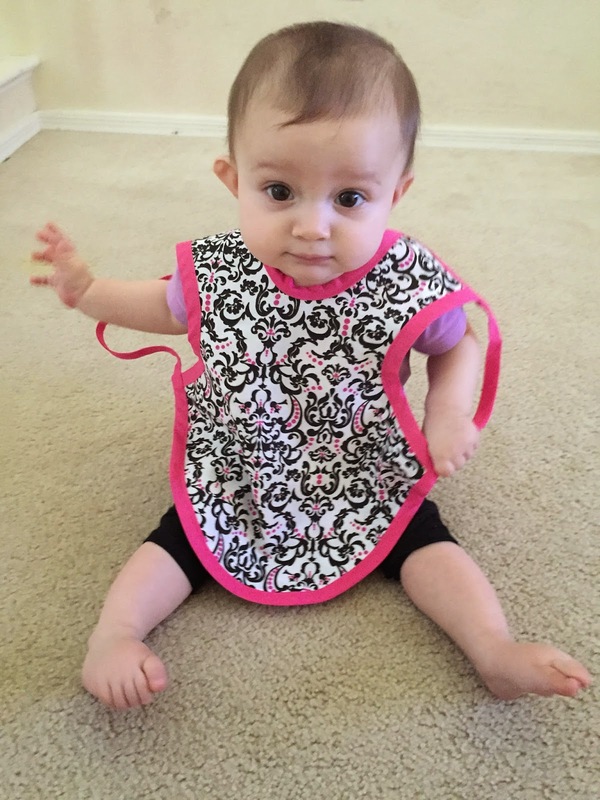 Here is the bapron, a bib and apron combo for babies and toddlers. There will be 2 sizes available, M (6-12 months) and L (2-3T) it could possibly fit a 4T toddler if they are small. Oh they are also reversible! This one will be listed in my shop. The Medium size will be $12 and the Large will be $15.